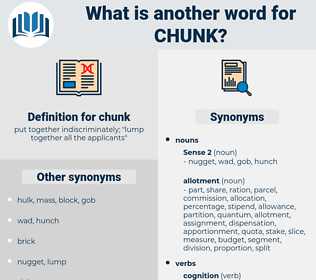 What is another word for chunk? put together indiscriminately; " lump together all the applicants"
a good/great deal of something. portion, portions, segment, part, block, tranche, amount. piece, snippet, slice, proportion, excerpt, bit, bloc, bite, share. 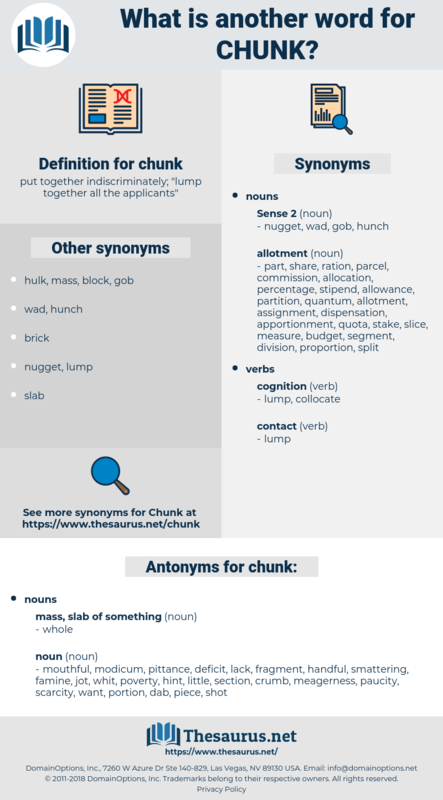 mouthful, modicum, pittance, deficit, lack, fragment, handful, smattering, famine, jot, whit, poverty, hint, little, section, crumb, meagerness, paucity, scarcity, want, portion, dab, piece, shot, pinch, inadequacy, shortage, dot, drop, dearth, bit, ace, skimpiness, ray, undersupply, dash, deficiency, sprinkle, insufficiency, scantness, scrap, smatter, absence, ounce, scarceness, scantiness, iota, taste. That chunk of granite there - doesn't it look to you as if it were freshly broken? It stood on a chunk of rock a couple of miles thick, and it looked like nothing more in this world than a welder's practice range. large indefinite quantity, large indefinite amount. compile, roll up, hoard, collect, accumulate, pile up, amass.